Wow, I enjoyed The Children far more than its quality merits. It’s a bad, bad movie. Bad acting, bad writing, technically deficient (especially the lighting — half the movie is almost impossible to make out) and nonsensical, it’s a poster child for how to not make a movie. Yet it is awesome. Why? Well, how about the fact that is about nuclear zombie children that kill with burning, radioactive hugs? Or the fact that these nuke-zombie children look normal, except for black fingernails (OMGoth!)? Or that they can only be killed by cutting off their hands? Or that nothing in this movie really makes sense and nothing is ever explained? These are all contributors to its greatness. When zombie movies go mainstream, sometimes they get really weird. Case in point: My Boyfriend’s Back, a screwball zombie comedy from the early ’90s. This is one odd film. In it, a teenager named Johnny dies trying to impress the girl he’s crushed on since the first grade. His unrequited love and her promise to go to prom with him, made as he is taking his last breath, brings him back as a zombie. He heads home and picks up his life as if he never died. The weird bit is that while everyone is quite surprised to see him, no one really thinks much of it or really reacts to it. They treat him like a pariah, especially once he eats a classmate, but they are remarkably chill about it. That may be because it’s happened at least once before in that town, some fifteen years prior, but still … you’d think it would cause a bit more uproar. The more Lucio Fulci films I see, the more I appreciate his work. 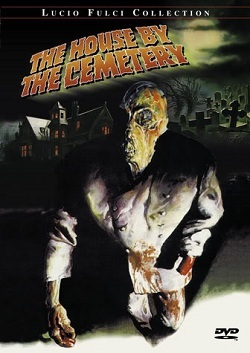 The latest, and last of the Fulci zombie flicks, is The House By the Cemetery. It’s your basic haunted-house tale, only the house is haunted by a zombie. Crazy! The zombie lives in the basement and emerges to murder and eat people to stay alive. A family moves into the house so the dad can do some research and pretty soon weirdness is erupting all over the place… The family has a weird-looking little kid and there’s a little dead girl that only the kid can see, and some weird crying coming from the basement. And a tombstone thing in the main hallway and of course the cemetery right outside. 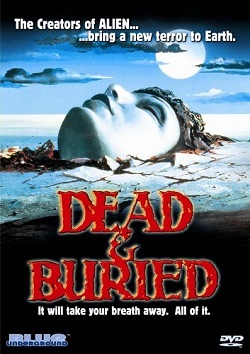 I really would have liked to like Dead & Buried more than I did, but it made it really, really hard. It’s not a terrible movie by any means, but it’s not anything special either. Let’s just say it’s no surprise it’s been all but forgotten. The movie is about a small town whose residents have a taste for ritual group murder. They show up en masse, kill someone (and film/photograph it for posterity) and then a few days later that person appears as a new resident of the town. Well, it’s one growth strategy… Not everyone in town is in on the murdering, though. The sheriff seems mighty perplexed by all the dead people and does his best (which isn’t all that great, honestly) to figure out WTF is going on. So it’s a kind of a Twilight Zone-esque murder-mystery with zombies, basically. Well, these Resident Evil movies just keep getting more and more ridiculous. I can’t decide if that means each one gets better or worse. 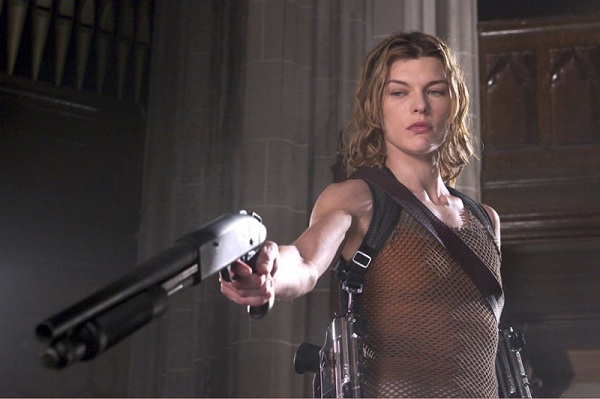 In any case, Resident Evil: Extinction is utterly ludicrous. And still kind of fun. What it isn’t is original. At all. In any way. It’s barely more than a pastiche of scenes and ideas from other, better movies. Start with a base of Day of the Dead — same underground base, same mad scientist doctor, parallel scenes and more — then mix in, well, everything. A little Mad Max Beyond Thunderdome fashion sense, a Texas Chainsaw Massacre/Devil’s Rejects style crazy family, the Rancor-pit scene from Return of the Jedi, shots straight out of Lawrence of Arabia, bird attack from The Birds, ideas from Scanners and/or the X-Men … How you feel about this sort of “borrowing” and your ability to shut your brain off for ninety minutes will largely determine how you feel about this film. Let me point out the obvious. Resident Evil: Apocalypse is pretty goddamn dumb. It’s a comic-book action movie loosely based on a videogame known for an incredibly convoluted and melodramatic storyline. With zombies. That said, it was also pretty fun. Shut off your brain, relax and float downstream. I can see why “serious” zombie fans would hate these movies. They are utterly lacking in the sort of subtext and symbolism we enjoy in the best zombie films. On the other hand, there are two hot women that spend the entire movie in skimpy clothing kicking, stabbing and shooting zombies and other bad guys in the face. You don’t come to these movies to be enlightened, you come to be entertained. And I was entertained. I have to say that Dead Meat was a pleasant surprise. I wasn’t expecting much out of it but it was actually a decent movie for fans of the genre. That’s not to say it was without some substantial flaws, but it was watchable and entertaining. 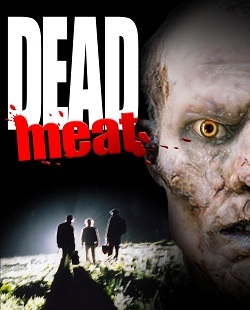 In Dead Meat, a massive outbreak of a mutated strain of Mad Cow Disease causes cows to go nuts and attack other cows and farmers. And what of the people they attack? You guessed it, they become zombies. The story proper starts when a youngish couple accidentally hit a man on the road, killing him (or so they think). They load him into their car to get help, only to have him awake and bite the man. The girl goes for help, finds more zombies and thus starts an uninterrupted chase scene that comprises the rest of the movie. 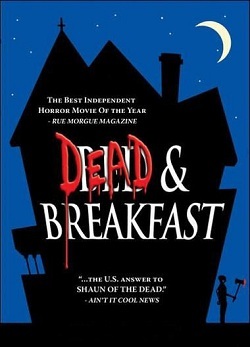 After watching Dead & Breakfast, I feel like it is somewhat unfairly overlooked. I didn’t love it, but I definitely liked and enjoyed it. It’s a high-quality movie, albeit one with some flaws, and it surprises me it doesn’t have more of a following. Ironically, I’d guess one of the reasons D&B doesn’t have a big cult following is it obviously tying very hard to be a cult movie. It’s just a little too self-conscious and tongue-in-cheek for its own good and I think that turns a lot of culty people off. That said, it never gets in its own way like some movies trying hard to be cult do. It keeps the film/story itself front and center from beginning to end. The story follows a group of young, attractive people on their way to a wedding. Naturally, they get lost and end up in the titular bed and breakfast, only to get stuck there when the cook is murdered and the proprietor dies of a heart attack. Before long, one of them has opened a box containing an evil spirit and bodies are being reanimated left, right and sideways. 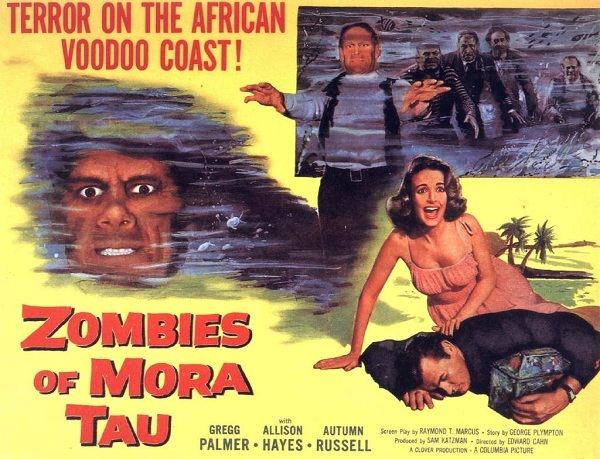 For a second-rate movie form the late ’50s, Zombies of Mora Tau isn’t half bad. I mean, it’s slow, somewhat dull and ultimately pointless, but aside from that, not too bad. This pre-Romero zombie “horror” movie (not at all scary and can’t imagine it ever was) gives us some tireless, waterlogged undead guarding a cache of cursed diamonds. When a pack of treasure hunters come for the diamonds, they run afoul of the zombies and … not very much happens. And it’s too bad, because the idea has some promise. You know, I am just not really feeling these Blind Dead movies. I saw the first, Tombs of the Blind Dead, a few years ago. It earned a solid “meh” from me. It wasn’t bad, it was great, it just sort of was. 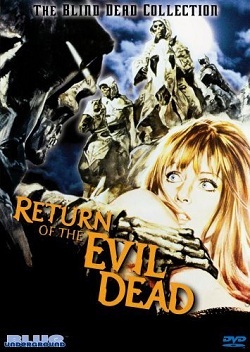 I heard the second, Return of the Evil Dead, was much better, so I scheduled it in this year’s marathon. And it was better, but still kind of mediocre. It’s basically a reboot of the first. Similar story, of undead Knights Templar returning to terrorize the land, but with some details tweaked for eye-burning goodness. That is to say, the knights get their eyes burned out this time, not pecked by birds. And a weird village idiot dude has to kill a girl to reawaken them. So he murders a girl (and a girl is murdered/raped in flashback by the original knights), the zombie knights come back and terrorize everyone. One by one they get killed, until morning. The knights disappear, the survivors survive, hurray!